House and Senate Republicans have introduced legislation that would prevent Congress from using commemorative coins to fund pet projects as a creative workaround to the earmark ban. In April, The Heritage Foundation’s sister organization, Heritage Action, first wrote about the commemorative coin process. Currently, Congressmen can introduce commemorative coin bills depicting national icons in their districts, such as the Pro Football Hall of Fame or Future Farmers of America. The bills are easily passed by bipartisan majorities, because it’s pretty difficult to vote against a Mother’s Day or March of Dimes commemorative coin. It is important to note that many of these organizations are non-profits that already receive federal funding and are perfectly capable of raising their own funds through various activities such as souvenir sales or—gasp—even making their own commemorative coins. The congressionally approved coin is then minted by the Treasury, which is completely reimbursed for the cost of the coins as coin collectors purchase them. Of course, if a coin doesn’t sell very well, the upfront cost of the minting could, in theory, not be recouped. But the Treasury is the first to be repaid upon the sale of the coins. Sounds pretty decent so far, right? 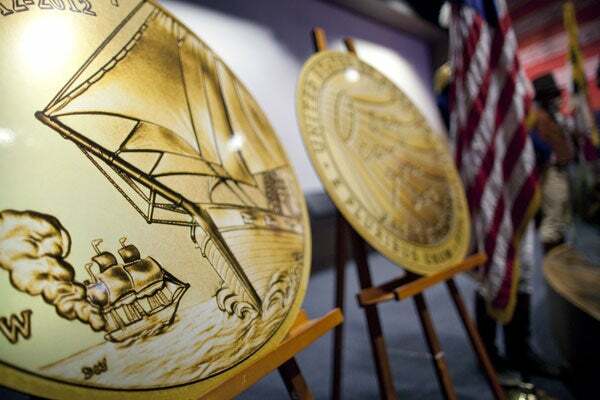 Collectors get a coin, and there’s no cost to the taxpayers unless the coin doesn’t sell. However, there is more to the story than that. On top of the purchase price of the coin (50 cents, $1, or $5), a surcharge of up to $35 is added. Since this process was created in 1982, coin collectors have paid over $418 million in surcharge prices, and those surcharges were then passed on to the non-profit organization commemorated on the coin. So the Treasury is recouped for the price of the coin, and the non-profit organization reaps the benefits of the surcharge. This has all the marks of an earmark—only without an appropriation or taxpayer money directly involved. Members of Congress can introduce bills for commemorative coins representing icons or other charitable causes in their districts, which in turn benefits from the sales of that coin. Of course, the Members in turn benefit as well, as they can tell their constituents that they brought home the bacon for a beloved landmark or non-profit organization. In June, The Wall Street Journal reported on one egregious example of this process: a Congressman whose former girlfriend worked for the lobbying group that had campaigned for one of these coins. Even after Amash raised these concerns, Congress continued to introduce commemorative coin bills, showing that stronger action needed to be taken. In the House, Amash and Representative Jeff Duncan (R–SC) introduced the Commemorative Coins Reform Act. In the Senate, companion legislation was offered by Senator Jim DeMint (R–SC), along with Senators Tom Coburn (R–OK), Lindsey Graham (R–SC), Kay Bailey Hutchison (R–TX), Ron Johnson (R–WI), Mike Lee (R–UT), and Jim Risch (R–ID). While the commemorative coin process does not run afoul of the official earmark ban, the obvious implications are that Congressmen are using a decades-old tactic to send special preferences to private organizations in their districts. The Commemorative Coins Reform Act would halt this by directing any funds raised from the surcharge to reimburse the Treasury Department for producing the coin, and anything left over would be used for deficit reduction. This is another good step to ending special (earmark-like) preferences for local constituents.